Every time you think we can't do any more for you at Fireworks, we come up with something else. We went from 56 pages of mostly black and white to 96 pages of full colour. We added cover CDs with great free music on them. We built this amazing website called Rocktopia where you can get up to date news, search reviews from previous issues and watch full performances from Firefest. What else could we do? How about putting out another stunning full colour 96 page issue, complete with FREE CD… containing more than FIFTY songs? That's right, FIFTY. Five-Oh. Pop the CD in your PC or Mac and iTunes will jump with delight at the mp3's it will discover on there. Some names will be instantly recognisable, like Robin Beck and Reckless Love. For the bands that might well be new to you, the CD also contains a FREE sixteen page PDF telling you everything you need to know about the artists on the disk. We haven't put the price up, it's the same as always. We've not scrimped on the content of the magazine either. 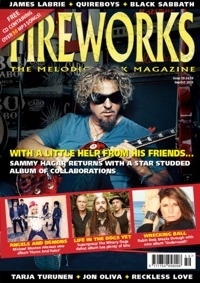 Legendary Red Rocker Sammy Hagar is in there, talking about his star studded new collaborations album. Supergroup, power trio, call them what you will, but the Winery Dogs are in there too. We take a look back at Black Sabbath during their comeback period with their second longest serving vocalist Tony Martin. Jon Oliva talks solo work and Trans Siberian Orchestra, while Michael Monroe waxes lyricals about his new solo album. The lovely Tarja is in stunning form, and that's before we've even mentioned Dream Theater vocalist James LaBrie, The Quireboys, Newman, John Elefante, Heaven And Earth, Edenbridge… 32 interviews in total! You can get a taster of them right here on Rocktopia. As well as the usual mass of albums reviewed (over 100 new releases reviewed, along with reissues, DVDs and books) we have festival reports and live reviews. Fireworks #59 - easily the best value issue we've ever put out. - Direct from Fireworks HQ by emailing [email protected], paying via Paypal. Send £6 (inc P&P) for UK, £8.50 (inc P&P) Europe, and £9.50 (inc P&P) for USA/Rest of World.